Looking to kick-start your nursing career in one of the UK’s largest teaching hospitals? We’re looking for newly qualified nurses to join the teams across our rapidly-advancing Trust. Providing a broad range of services, our teams across the Trust are able to care for patients from across the south of England – from the start of life to the end. This means that you have huge variety in the people you work with, the patients you see, and the career pathways on offer to you. We want to give all newly qualified nurses the strongest start to their careers, which is why we offer a comprehensive two-week induction and a well-supported preceptorship programme that will equip you with all the skills you need to be an excellent nurse. We’ve worked hard as a Trust to improve the efficiency of our services. We are one of England's largest acute teaching trusts and have recently been rated ‘Good’ by the CQC. In the latest national NHS Staff Survey, we were in the top 10 acute trusts for staff engagement and for staff recommending the hospital as a place to work or receive care. Southampton was recently ranked as the third best place to live and work in the UK by PwC, and has been recognised as one of the best cities in the UK for young people to live. Situated on the south coast, with an international airport, meaning you are only a short flight away from Paris, Madrid, or Milan, and only an hour on the train from central London. The picturesque New Forest National Park and the beaches of the Jurassic Coast are also right on our doorstep. The city offers living costs 20% lower than those of London, 13 schools rated outstanding by Ofsted and as many as 13 expansive parks and green spaces to enjoy. 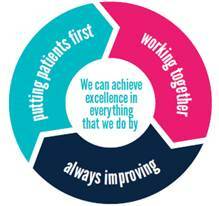 At UHS, we’re guided by our values of putting patients first, always improving and working together. So if you’re passionate about patient care, dedicated to making progressive improvements, and a great collaborator, we’d love you to join us. If you have completed a dual field programme (child/adult or mental health/adult), please specify in your application the areas you’re interested in joining to enable you to maintain both parts of your registration. Please provide both an academic and clinical reference. We welcome applications from nursing students within 18 months of qualifying. To find out what our staff think about working here, you may also wish to look at our most recent friends and family test and NHS staff survey results, or our latest CQC report. We offer parking on site at UHS or through one of our park-and-ride schemes on a limited basis, based on specific eligibility criteria. We encourage our staff to utilise other green methods of getting to work such as cycling or walking where possible, and our Trust is well connected through bus services to the city centre and other areas. Read more here. The European General Data Protection Regulations enhances individuals’ rights and safeguards all of their data in place under the DPA. Please click here to see how and why we store your information.